As readers of our Family Dental Beaverton blog know, recent studies have linked poor oral health to an increased risk for a variety of severe health problems, specifically heart disease. While researchers have debated in recent years why this connection seems to exist, a new study may help shed some light on the subject. The results of a Finnish study suggest that an undetected infection at the root of a tooth could increase the risk of heart disease. Acute coronary syndrome – the clinical term for a heart attack – is 2.7 times more likely in patients that suffer from untreated tooth decay that requires root canal treatment to correct. When the root of a patient’s tooth becomes infected, tooth decay is usually the most common cause. In many instances where the root of a tooth is damaged due to decay, a root canal is required to remove the decayed and damaged pulp so that the structure of the tooth can be saved. When patients in need of a root canal fail to undergo the procedure, the severity of decay becomes worse and the longevity of the tooth becomes uncertain. Unchecked, permanent tooth loss may result. As part of the study, researchers examined over 500 Finnish patients with an average age of 62 who were experiencing heart problems at the time of the study. Using angiography, researchers examined the coronary arteries of the patients, of which 36 percent were found to suffer from stable coronary artery disease, 33 percent were undergoing acute coronary syndrome, and 31 percent did not suffer from any significant coronary artery disease. Researchers then examined the teeth and jaws of each participant using panoramic tomography. Approximately 58 percent of the participants were found to have one or more inflammatory lesions. Researchers also discovered that dental root tips infections were linked with an increased level of serum antibodies related to the bacteria that cause such infections. This indicates that oral infections affect other parts of the body as well. Gum disease, such as periodontitis, not only is viewed as a risk factor for coronary artery disease but for diabetes as well. Infections of root tips have not been examined in this context much previously, but they too appear to have a link with low-grade inflammation. Each year, cardiovascular disease causes 30 percent of deaths worldwide. This disease can be easily preventable by losing weight, eating a healthy diet, exercising, and not smoking. To help protect heart health, researchers recommend taking the necessary steps to help improve oral health. Researchers also noted that more study is needed before a definitive answer can determine whether treating a root canal can lower the risk of heart attack. Fortunately, you can lower your risk of heart disease while significantly improving your oral health in just three easy steps. Brush at least twice a day for two minutes each time. This will help to remove harmful oral bacteria and food particles from your mouth. Floss daily. Flossing helps to remove bacteria and food from areas of your mouth a toothbrush cannot reach, such as between your teeth and below the gum line. 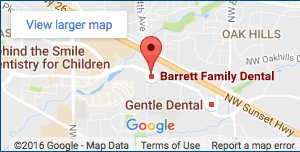 Schedule regular exams and cleanings with Dr. Barrett. By following these simple tips, you’ll enjoy a healthy, great-looking smile for a lifetime. Be sure to check back at the Family Dental Beaverton blog for more of the latest dental health news.